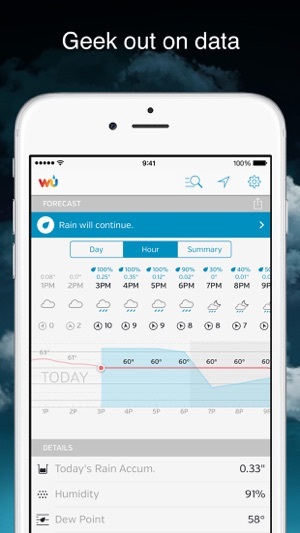 Weather Underground for iPhone, iPad, and Apple Watch is your everything weather app. 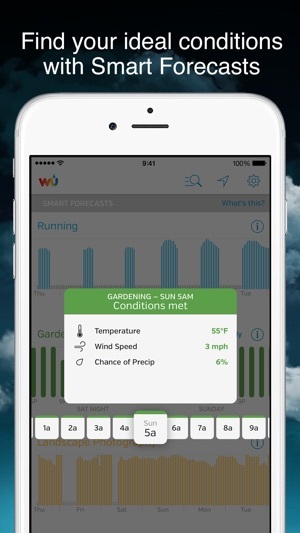 Powered by our network of 270,000+ personal weather stations, this app provides hyper-local forecasts and current conditions, interactive radar, customizable alerts, and much more to ensure you’re always prepared for whatever the weather brings. 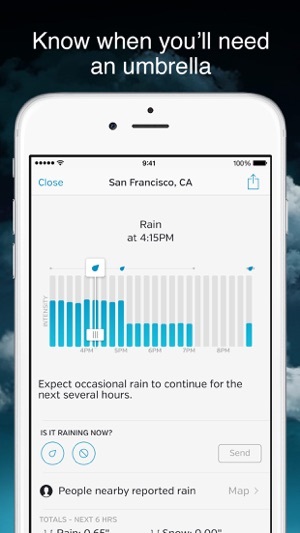 Get all your weather data at a glance with Weather Underground for Apple Watch. Quickly view current conditions, hourly and 10-day forecasts from local weather stations, and stay ahead of the storm with severe weather alerts and radar. About Weather Underground: Founded in 1995 as the first online weather service, Weather Underground supplies weather data solutions to the many of the leading media companies and millions of users across the globe through their mobile apps and website wunderground.com. With over 270,000 personal weather stations worldwide, Weather Underground is able to provide meaningful and reliable weather data to people in real-time. 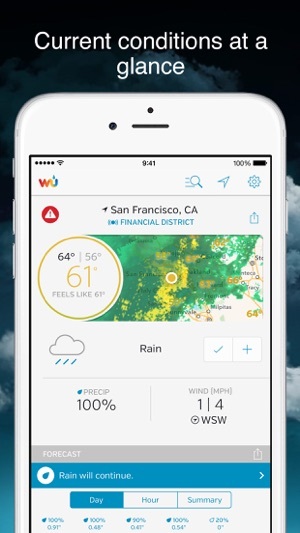 Weather Underground is part of the Weather Company and based in San Francisco, California. • Updated location permission request language. And I quote, “We, our service providers, and our Ad and Analytics Partners (see Section 2 for more information) may collect location information through the Services... If you access the Services on your mobile device, we may, depending on your application and operating system settings, directly collect precise geographic location information and sensor data via Global Positioning System (GPS), cellular network information, and other location-based features. Depending on your mobile device's operating system, we typically receive the latitude and longitude of your mobile device, as well as date and time and sensor data such as altimeter ... If you allow any of the Weather Channel mobile applications to directly collect location information while the mobile applications are running in the background, you will enable continuous location collection.” This is from the The Weather Underground website, despite mention of “Weather Channel” above. If you want to find the original just search the internet under some of the above text. 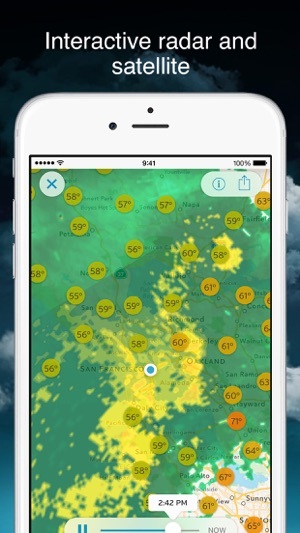 This app is hands-down the absolute best weather app out there! When I heard about all the changes with the weather underground I started looking for another way to find my weather. After a week of searching and testing of numerous other apps (and regrettably paying for a couple of them 😡), I have found my way back to Weather Underground. I just can’t get around how complete and perfect it is! I always found myself comparing other apps to it. I was sad to see the storm and lightning tracker disappear and felt that it was getting closer and closer to weather underground disappearing all together. Please know this is pretty much perfect in my book! If you could find a way to integrate the storm and lightning into the original app it would be perfect! Please don’t stop improving this app with updates and what not! Even with all the recent changes I’m still reading it 5 stars! Slow and some times nonexistent connection to server. Back to 4 stars. WU fixed a number of bugs and the speed is a bit faster. Still miss that icon badge. Dropped to 3 stars. I'm ok with the v5 interface. The forecast graph has gotten better with it's precipitation inheritance from the v4 widget. But here's where WU losses another star: Still no temperature icon badge, the new notification widget is unreliable for current conditions, and the radar preview window is clogged with personal weather station data to where the actual radar is nearly impossible to see. Question to WU: Who is gathering Voice of Customer? Dropped to 4 stars. I sent an enhancement request for an icon badge for current temp. Their response was "no plans to add". Wait a second, this is a weather app. Why would a developer of a weather app not have plans to provide the current temperature in an icon badge? This is the first and only app that I subscribe to. At $2 a year to remove ads, it's a great deal. I discovered recently that Intellicast get's it's data from WU. So I decided to go straight to the source. Clean and intuitive interface makes this one of my top shelf apps. A word of warning: Be wary of PWS (personal weather stations) when setting your custom location. Not all PWS's have accurate data. Chose a local airport or NWS station for best results.